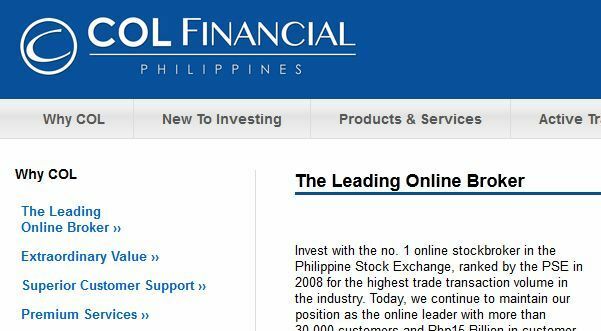 I received several queries on how to open an account online for stocks trading, especially those OFW friends. To save myself from repeated instructions, I decided to blog it for your reference. Citisec Online is the leading Philippine stocks broker online. I will guide you how to open account to them. To start with, you need to fill up some forms with your complete details. Download the forms by clicking it. And one copy of any billing statement: phone, credit card, bank statement as long as it contains your name and address. They need the original for this one. Now you should have the 3 fill up and signed forms, photocopy of your valid ID and original billing statement. Put everything in one envelope and mail to below address. Once they received your application form, they will process it and send you email notification. Make sure you fill up your email address correctly on the form. Together with the email, they will give you your COL Account username and password. They will also instruct you to deposit your initial fund now. At this time, you can login to www.colfinancial com and navigate the site. But you don’t have the fund yet to actually trade stocks. You can deposit either Php5K (for EIP) or Php25K (normal account). 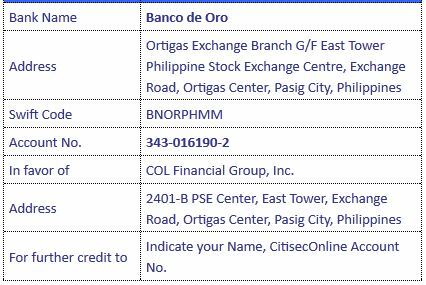 If you have the means, go for Php25K but if you only have Php5K, go ahead and deposit the money to COL bank account below. Additional information on how to fund your account is available on the confirmation email that they will send to you. Never mind about the difference between EIP and normal account, not an issue actually. If you deposit the money from abroad, try to scan the transaction receipt and send to Citisec support. Just reply on the confirmation email they send to you. If you need more information from CITISEC, visit their FAQ site HERE. Happy trading! If you need help or any questions, just leave your comment or post in my facebook fan page. Make sure you hit the LIKE button to subscribe on my updates. Thanks for posting this Chado! Hopefully, more OFWs and non-OFWs will be encouraged to invest in stocks. Philippine economy is improving! tama ka russ…:-) currently, there are around 1% to 2% of Filipinos investing in stocks. Imagine if we continue to advocate in stock investing, in 10 years it will BOOM. the right time is now, don’t wait after 10 years. salamat bro. sana maraming mga kababayan natin ang makabasa ang ma inform na ganito lang kadali mag open ng account at mag start ang trade ng Philippine stocks.